Public arts have always played an indispensable role in shaping the image of Taipei City. Earlier public artworks such as bronze statues of historical figures or mosaic wall paintings in public areas, have not only been ingrained in the memories of local citizens, but have also contributed to the understanding, appreciation and enhancement of public places. Since the enactment of the Public Art Ordinance in 1998, public art in various forms has entered the public domain in such places as MRT stations, schools, and government organizations. Public art works that have interactive qualities attract attention, and generally remain free from association with certain stereotypes. 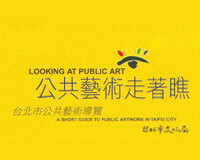 In order to encourage public art and promote collaborative efforts that can foster better understanding among Taipei City citizens and encourage them to learn more about the cultural, artistic, and scenic aspects of the capital city, the Department of Cultural Affairs, Taipei City Government has compiled a brochure that introduces 300 public art works and maps out six strolling routes that feature art works in public venues. We have compiled a name list including detailed information on talented artists, art education, art reviews, art administration, and applied arts regarding public artworks. More than a dozen essays on public arts have also been included to help establish a public art review system for evaluating planning applications. We have also established an online public art management system, offering up-to-date information for government agencies to review and receive handy advice on public arts projects. We believe the overall effort to create a public art-friendly environment is essential for enriching the caliber and quantity of public arts contributors.